This moment will haunt Cowboys’ fans forever. Trailing the Packers by five points in the Divisional Round, Dez Bryant seemingly hauled in a 30-yard pass — more than likely setting Dallas up for the go-ahead score. Instead, the play was deemed incomplete and the Packers would go on to win. Everyone thought Dez made a clean catch, except for Green Bay and the zebras. Facing a 27-23 deficit with under 40 seconds remaining in the game, Jerry Rice appeared to fumble away San Francisco’s chance at another Super Bowl. Ruled down on the field, Rice clearly lost control of the ball before hitting the ground. Instead, the 49ers maintained possession of the ball. 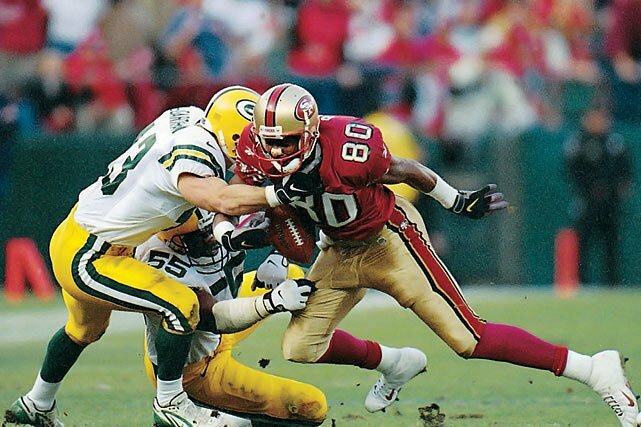 Four plays later, Steve Young and Terrell Owens connected for the game-winning touchdown. The Packers went on to miss the postseason the next two years. Replays have frequently been a point of contention in professional sports. Some people believe there are too many reviews, while others want more clarity. When the Seahawks traveled to the Meadowlands to take on the Jets, they had playoff aspirations. Unfortunately, a referee mistakenly identifying Vinny Testaverde’s white helmet as the ball — really — resulted in a crushing defeat. 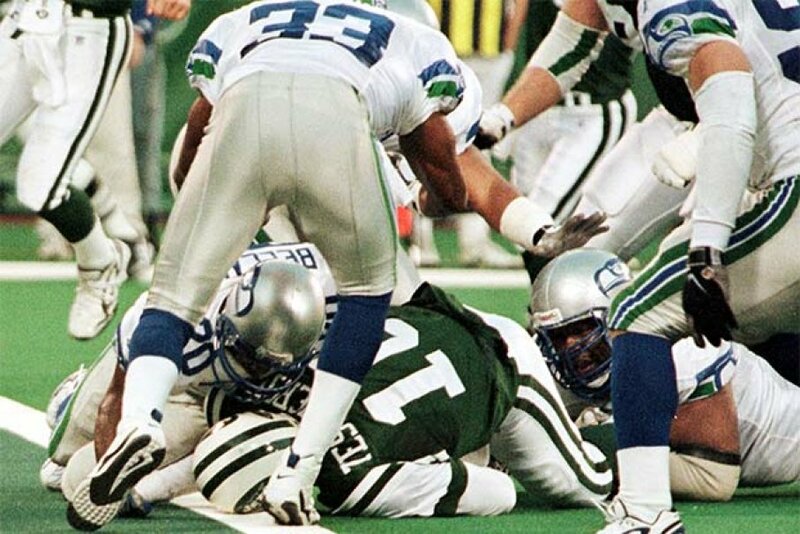 Needing one stop to claim victory, Seattle stopped Testaverde from crossing the goal line on fourth down. However, when the referee deemed the quarterback crossed the line, the Seahawks efforts were nullified. Before Boston’s recent string of success — four World Series titles since 2004 — the Red Sox were seemingly cursed. Game 4 of the 1999 ALCS provided another memorable moment in the Red Sox–Yankees rivalry. Trailing by one run in the bottom of the eighth, Boston had the tying run at first with one out. John Valentin sent a chopper to second where Chuck Knoblauch was stationed. The Yankees second baseman failed to tag the runner (Jose Offerman), but threw to first to get an easy out. Unfathomably, the second base umpire called Offerman out. Predictably, Boston would go on to lose the game and series. The 2006 Rose Bowl featuring No. 1 USC and No. 2 Texas is one of the greatest games of all-time. Unfortunately, the game was not bereft of controversy. Trailing 7-3, Texas was gifted a go-ahead touchdown late in the first half. 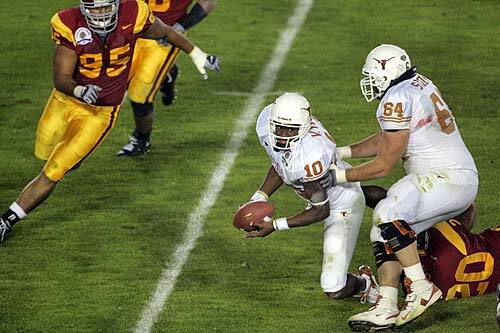 Texas’ Vince Young successfully pitched the ball to Selvin Young who then scampered 10 yards for the score. The score should not have counted. Replay showed Vince Young’s knee was down before he pitched the ball. The Longhorns would go on to win 41-38. Home plate umpires have an unenviable task. 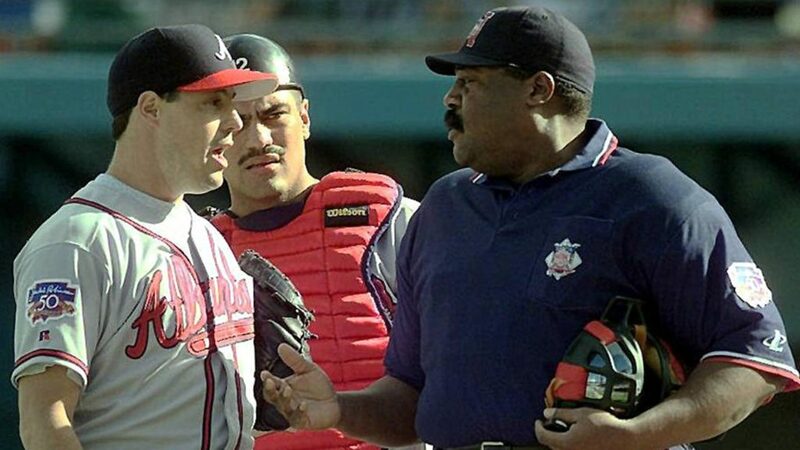 Calling balls and strikes is not as easy as it sounds, but in Game 5 of the 1997 NLCS, Eric Gregg failed horribly. Gregg was consistently bad throughout the game. Pitches that were nearly a foot off the plate were being called strikes. The pitch that ended the game was especially egregious. Atlanta’s Fred McGriff was rung up on a pitch that was easily a foot outside. The Marlins carried the momentum to Atlanta and scored four runs in the first inning of Game 6 — a game which ended in a 7-4, series clinching victory. The Steelers were a dominant force from 1975-1980, capturing four Super Bowls in that time. 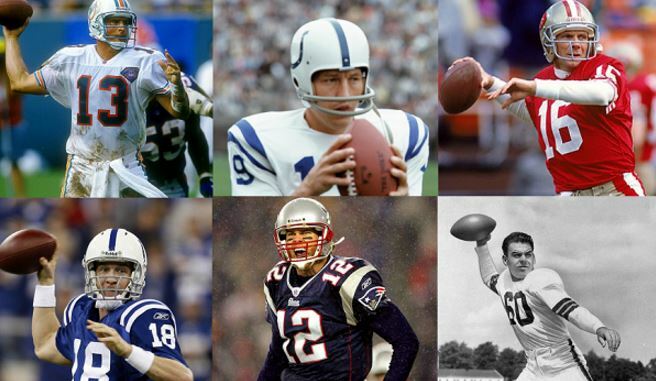 It never hurts to be lucky, and the Steelers certainly were fortunate in that regard. Leading 17-10 over the Oilers in the 1980 AFC Championship, Houston receiver Mike Renfro caught what should have been the tying touchdown. The referees didn’t see Renfro come down in bounds, however, and Houston settled for a field goal. Pittsburgh would go on to win 27-13, and claim its fourth Super Bowl in six years a few weeks later. Biased judging at the Olympics is not uncommon. 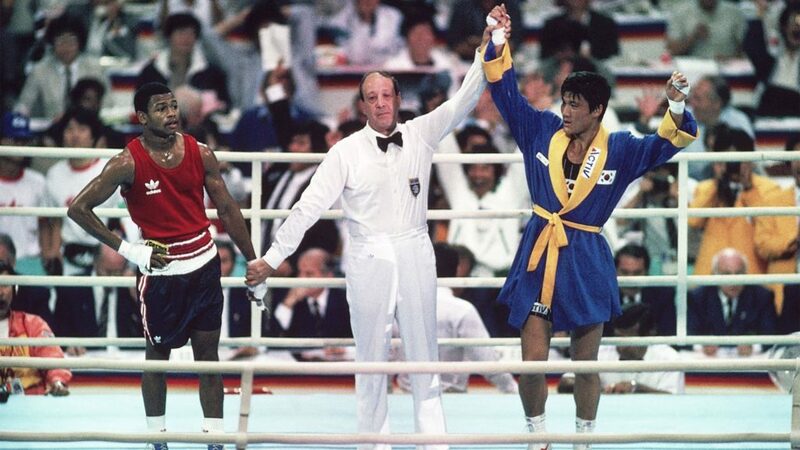 The 1988 Olympics in Seoul, South Korea, were no different. Competing for the boxing gold medal, Roy Jones Jr. pummeled his opponent, Korea’s own, Park Si-Hun. Jones landed over 50 more punches and forced Si-Hun into two standing eight counts. Despite his utter dominance, Jones was robbed of the victory and had to settle for silver. The World Cup is the most beloved sporting event around the world. Occurring every four years, entry into the tournament is extremely important to competing counties. In 2009, France and Ireland met with a 2010 World Cup berth on the line. With the aggregate sitting at 1-1, the two sides were minutes away from penalty kicks deciding which nation would advance. French superstar Thierry Henry committed a blatant handball in the 103rd minute, contacting the ball with his hand twice, to set up the crucial goal. Ireland protested the result and called for a rematch — FIFA rejected the protest. To this day, I do not understand how this situation could possibly unfold. Trailing the Tigers and driving for a game-winning drive, the Buffaloes scored the go-ahead touchdown on 5th down. Yes, 5th down. The Buffaloes spiked the ball to stop the clock, and the referees somehow overlooked the play. 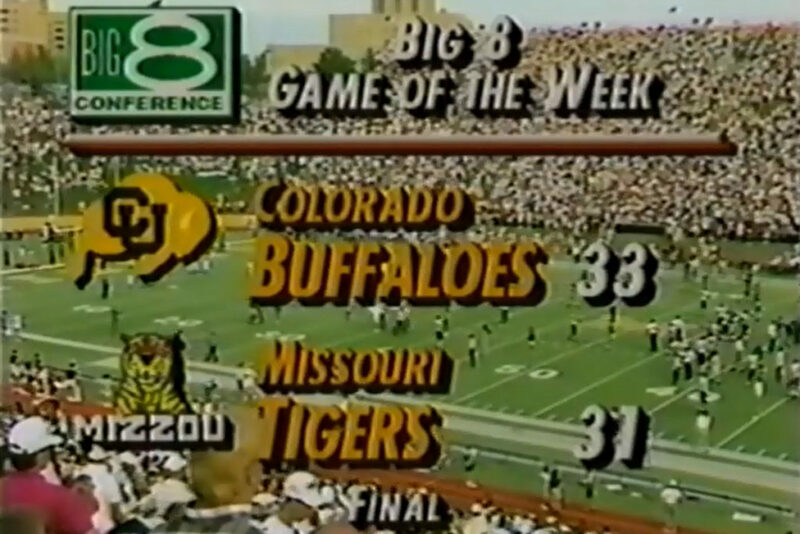 At the conclusion of the 1990 season, Colorado was ranked No. 1 in the AP Poll. Had it not been for the Buffaloes extra down, they would still have zero National Championships. The simplest task during a football game is the coin toss. Unless you’re referee Phil Luckett. When the Steelers and Lions met on Thanksgiving Day in 1999, Steelers captain Jerome Bettis was tasked with calling the toss in overtime. Bettis called “tails.” Luckett claimed the Steeler called “heads.” The Lions won the toss and promptly won the game. Another lucky break for the Yankees! The setting: Game 1 of the 1996 ALCS against the Orioles. The play: Derek Jeter sends a drive to right field. Orioles’ right fielder Tony Tarasco camps under the ball, seemingly in position to make the catch. The result: Jeffrey Maier, a 12-year-old Yankee fan, reaches over the fence and catches the ball above Tarasco. Umpire Rich Garcia rules the play a homer, giving the Yanks the tying run. New York would win the game in extras, and eventually take the series 4-1. It has been nearly 17 years, but Sacramento is still not over the 2002 Western Conference Finals. Former NBA referee turned disgraced felon, Tim Donaghy, was accused (later convicted) of gambling on games in which he also refereed. 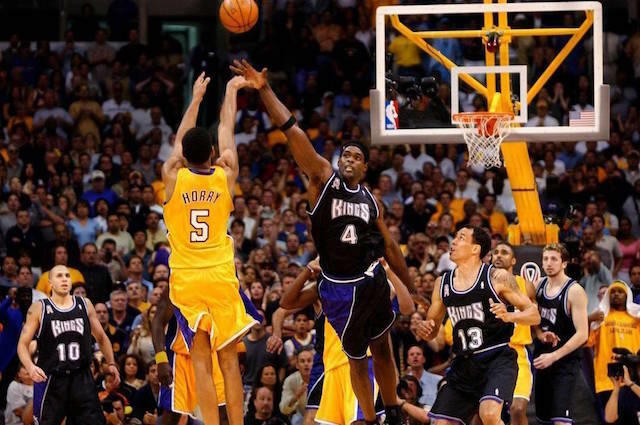 Donaghy famously suggested that Game 6 of the 2002 Western Conference Finals between the Lakers and Kings was fixed. The Lakers, down 3-2 in the series, attempted 18 more free throws than Sacramento in the fourth quarter of Game 6. Poor Buffalo. First, the Bills lose four Super Bowls in a row. Then, in 1999, the Sabres lose the Stanley Cup in an excruciating fashion. Down 3-2 in the series, the Sabres were battling for their lives against the Dallas Stars. 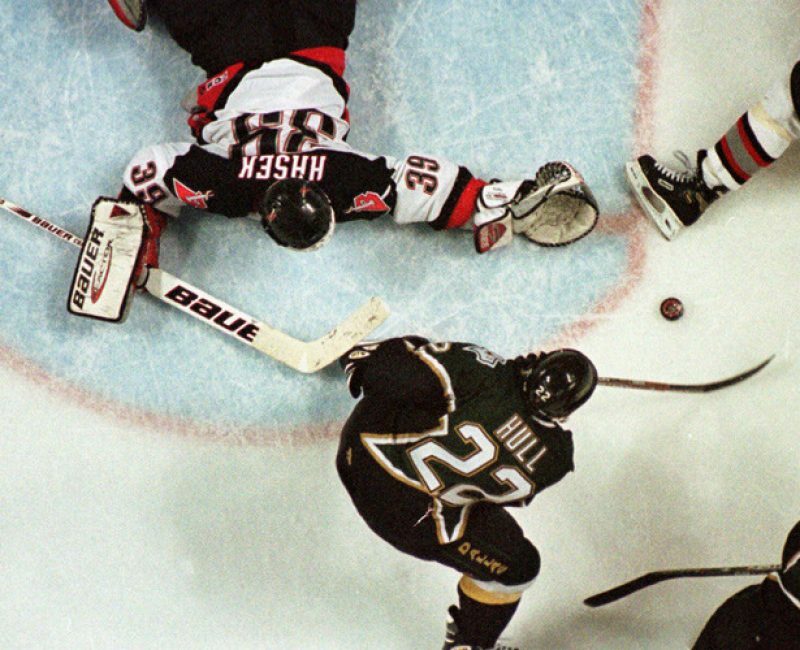 In the midst of a third overtime period, Brett Hull scored the series-clinching goal — but it shouldn’t have counted. Hull’s skate was in the crease before the puck, but the call wasn’t made. In addition, the refs failed to ask for a replay. The Stars won the Cup, Buffalo shed many tears, and the NHL fixed the rule before the start of the next season. Jim Joyce and Armando Galarraga will forever be linked. Pitching for the Detroit Tigers, Galarraga was one out away from a perfect game. Then, this happened. There isn’t much to say about the play. The runner was out. Joyce called him safe. This is why replay was introduced to the sport a few years later. Diego Maradona is one of the five best soccer players of all-time. In the 1986 World Cup, Maradona scored arguably the greatest goal in history, and also the most infamous. Both took place in the quarterfinals against England. 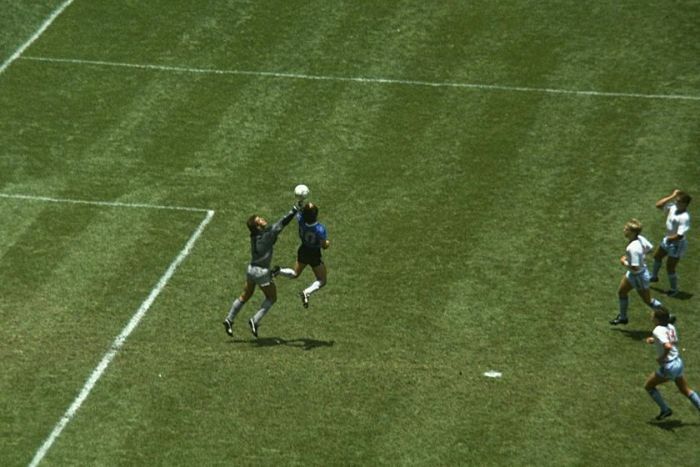 The first goal is known as “the hand of God.” Maradona made a deft run into the box, splitting multiple defenders before punching the ball past the keeper. The ref missed the hand ball and the goal stood. To be fair, Maradona’s second goal, aka “the goal of the century,” was incredible, but had the hand ball been called, there is no telling how the match would have finished. 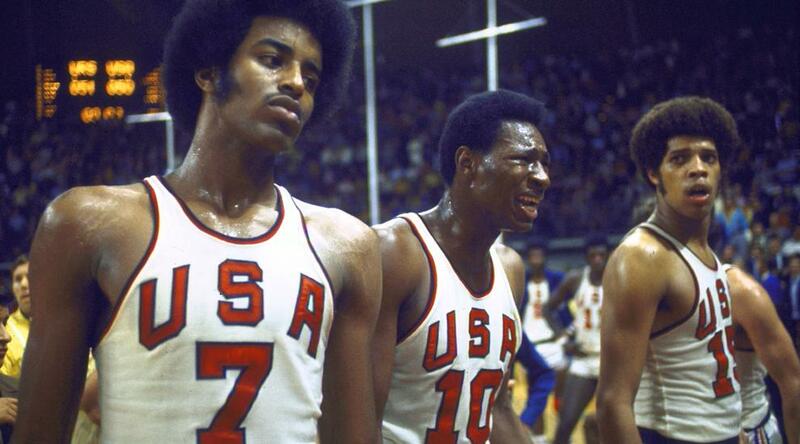 The United States is nearly unbeatable in international basketball. The men’s team suffered its first loss in a highly controversial fashion. Heading into the 1972 Olympics, the United States had won the previous seven gold medals. After rolling through its first eight games, the Soviet Union stood in its way of gold. The U.S. held a one point lead with three seconds to play. In a suspect string of events, officials put time back on the clock twice in the final seconds — giving the Soviet Union three chances to win. The Soviet Union won 50-49. Apologies to Armando Galarraga, but this particular failure at first base far surpasses his stolen perfect game. 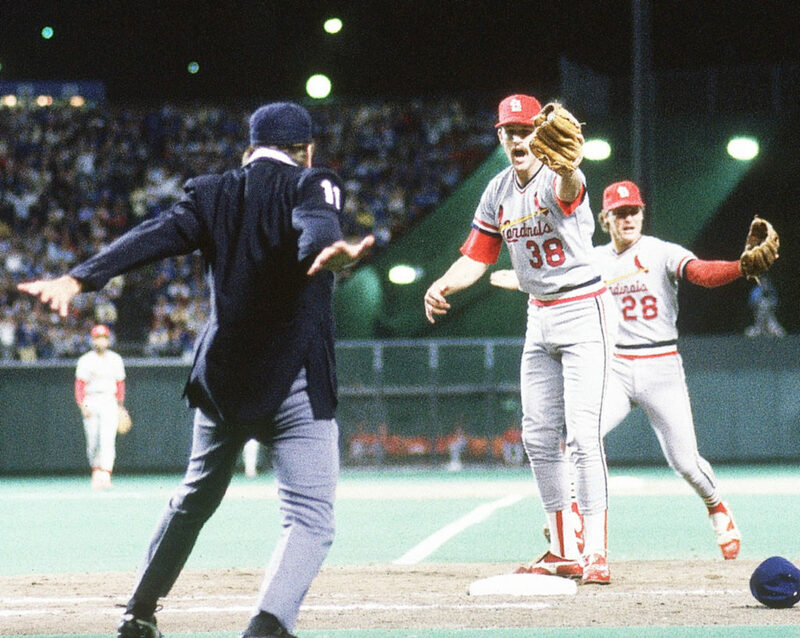 The 1985 World Series between the St. Louis Cardinals and Kansas City Royals went the distance — but only because of Don Denkinger. The Cardinals, ahead in the series 3-2, were three outs away from clinching the World Series when disaster struck. Up 1-0 in the bottom of the ninth, the Cardinals seemingly recorded the first out of the inning on a routine ground ball hit by Jorge Orta. Orta’s slow chopper was fielded by first baseman Jack Clark. Clark’s throw to Todd Worrell — St. Louis’ closer whom was covering first — beat Orta to the bag. Although Orta was clearly out, Denkinger called him safe. Kansas City would go on to score two runs in the inning, forcing a decisive Game 7. The Royals won Game 7 in dominant fashion, 11-0.